Blue Mountains City Council recognised three local citizens for their outstanding contribution to the community and welcomed 24 residents as Australian citizens at the 2018 Blue Mountains Local Citizen of the Year Awards and Citizenship Ceremony held at the Blue Mountains Theatre in Springwood today. Carmel has excelled in providing service to women’s sport, devoting her time to coaching, mentoring, and running netball in the Blue Mountains for almost 50 years. Andrew has given up his time to make sure the Blue Mountains community is a safe, fun and accepting environment for everyone, but particularly for young people. Andrew has been an active and engaged Blue Mountains Youth Councillor since the start of 2016. During his time as a Youth Councillor Andrew has provided great support for the youth congress ‘Project NOW’ which led to Andrew’s involvement in the Youth Summit Radio program. The Springwood Foundation Day Festival is a long running community event that celebrates the Springwood’s heritage and showcases what it has become today - the 2017 event was a highly successful day with all funds raised going back into the local community. Mayor, Cr Mark Greenhill, said, “On behalf of Blue Mountains City Council and the community, I offer my heartfelt congratulations to these outstanding local citizens, all deserving recipients of the 2018 Blue Mountains Local Citizen of the Year Award. It is fitting that their contribution to the Blue Mountains community is acknowledged in the highest regard. They inspire us through their achievements and challenge us to make our own contribution to creating a better Blue Mountains and a better Australia. Twenty four Blue Mountains’ residents from eleven countries of origin become Australian citizens at the civic event. The Mayor was joined by the 2018 Australia Day Ambassador appointed to the Blue Mountains, the Special Olympics Dance Group. The group was formed in 2006 and became Australia Day Ambassadors in 2007. To date, the group has raised over $1.87 million to help with the growth and development of the Special Olympics Australia, allowing those with an intellectual disability the opportunity to participate in regular weekly sports and dance programs. The Special Olympics Dance Group leader, Mel Eustace, acknowledged the local award recipients for serving as inspirational role models to us all. Nominations for the Blue Mountains Youth Council are now open! Blue Mountains City Council listens to the opinions and aspirations of young people in our community. If you are between 12 and 19 years old (turning 20 in 2018), live in the Blue Mountains and want to make a difference, why not join the Blue Mountains Youth Council. The Blue Mountains Youth Council is a committee of 20 local young people who meet monthly to identify and discuss issues important to them, plan and run events, and advise the Council. Successful applicants remain members for two years when they can reapply, if they wish. The Youth Council has young people from all kinds of backgrounds, nationalities and ages. Applicants don’t necessarily need any experience, just an interest in what’s happening around them. Nominations are open now until Monday 19 February 2018. In 2017, the Blue Mountains Youth Council helped maintain young people’s ideas from the ‘Project NOW’ congress which included the ongoing Youth Summit radio show and the Food Forest community garden. They also attended a NSW Youth Council Conference in Ryde and participated in a movie event at Lawson Swim Centre to celebrate the end of school. Blue Mountains Youth Councillor, Paul Mukhin said, “I joined the Blue Mountains Youth Council in early 2015. We’ve been able to have an input into Council planning that is relevant to young people, and projects that improve the lives of young people in our region. To find out more and apply, visit bluemountainshaveyoursay.com.au/youthcouncil, facebook.com/bluemountainsyouthcouncil; or contact Council’s Youth Services Development Officer, Anita Kazis on akazis@bmcc.nsw.gov.au, 4780 5680 or 0431 501 545. Photo: Calling all young people who want to be heard and ‘do democracy’! Practicing how to pitch on video at the NSW Youth Council’s Conference was one of the Blue Mountains Youth Council’s activities of 2017. The Blue Mountains Youth Council is celebrating the end-of-school with a pool-party, movie screening of Beauty and the Beast and this year’s Community Christmas ‘Giving Tree’ gift drive. Young people of the Blue Mountains are invited to relax by the pool, celebrate the end of the school year, meet new people, and donate a gift that will give a hand to their peers on Saturday 16 December at the Lawson Swim Centre for the same price as ordinary pool entry of $4.60. Blue Mountains Youth Councillor Leah Roscoe-Bynon said, “This year the Youth Council is working with the Blaxland Library for our Community Christmas ‘Giving Tree’ project. All donations received will go to the Platform Youth Services organisation, who will distribute the gifts to vulnerable young people aged 12-25 in the Blue Mountains, Penrith and Hawkesbury areas. Gifts can be donated at Blaxland library until Thursday 21 December. Teenager-friendly Christmas gifts include things like iTunes vouchers, headphones, movie ticket vouchers, hair accessories or new clothes. Mayor, Cr Mark Greenhill said, “The Youth Council ‘Giving Tree’ is a great project, and brings a bit of joy to those people who are in need or finding it difficult during the holiday season. For further information, please contact Anita Kazis, Council’s Youth Services Development Officer on 4780 5680 or akazis@bmcc.nsw.gov.au. Or visit www.facebook.com/bluemountainsyouthcouncil. Photo: Blue Mountains Youth Councillors Jack Prowse & Andrew Gunn are ready to party at Lawson on Saturday 16 December. The July meeting of the Blue Mountains City Council had a temporary change to its leadership with the appointment of Youth Councillor Benjamin McGrory to serve as Assistant Mayor and co-chair of the meeting. Mayor, Cr Mark Greenhill, guided the 18 year old Blue Mountains Youth Councillor in his role to assist with the meeting proceedings. Benjamin is a returning Youth Councillor, now in the role for his third year. A Katoomba resident and Sydney Distance Education High School student, Benjamin joined the Youth Council to become a voice for young people in society, particularly students coping with mental illness. In his previous term in the Blue Mountains Youth Council, Benjamin assisted in planning the Project NOW! Youth Congress and has received training in community consultation. The opportunity to act in the role of Assistant Mayor and co-chair of the meeting is available to Youth Councillors once a year. Benjamin was selected for the role by random ballot at the previous Youth Council meeting. At the meeting, the Council unanimously resolved to endorse the membership of the 2017 Blue Mountains Youth Council and thank the outgoing Youth Council members for their contribution to our community and welcome the 13 continuing and nine new members of the Youth Council. The 2017 Blue Mountains Youth Council membership is: Maya Costa, Benjamin McGrory, Brodie Wylde, Aleksandrs (Sasha) Titovs, Paul Mukhin, Maisy Costa, Rohan Grant-Dawes, Shannon Grazotis, Andrew Gunn, Meg Hill, Alexandria Hinley, Sophie Jansons, Jessica Johnson, James Khnouf, Caitlin Marlor, Michael Pankhurst, Jack Prowse, Leah Roscoe-Bynon, Delilah Scott, Adam Tjoelker, Alexandra Whatmuff and Caspar Zauner. Photo caption: Mayor, Cr Mark Greenhill, with Blue Mountains Youth Councillor, Benjamin McGrory, who was Assistant Mayor and co-chair at Council’s July 2017 meeting. Blue Mountains Youth Council delegates recently attended the 2017 NSW Youth Council Conference at Macquarie University to learn and return with new skills focused on the use of technology. Hosted by the Ryde Youth Council, representatives from over 20 rural and city areas in NSW attended the three day conference, spanning as far north as Armidale, Tumut to the south and Cobar to the west, expressing a varying views on news and issues for young people. The theme Make IT Happen is a platform for how to harness the power of technology to connect and engage all people. Mayor, Cr Mark Greenhill, said, “I am pleased that young leaders from our community could benefit from the experience and advice of other young change agents, as well as political leaders and leaders in the technology sector. The Governor of NSW, HE General The Hon. David Hurley AC DSC (Retd) opened the conference. Thirteen young people representing the Blue Mountains at the conference – Maya Costa, Rohan Grant-Dawes, Alexandria Hinley, Sophie Jansons, Caitlin Marlor, Benjamin McGrory, Paul Mukhin, Aleksandrs (Sasha) Titovs, Adam Tjoelker, Brodie Wylde, Caspar Zauner, Kiralee and Leah Roscoe-Bynon. Blue Mountains Youth Councillors aim to develop a live music event, which will not only entertain and bring together young people, but offer advice and information on important issues such as mental health. 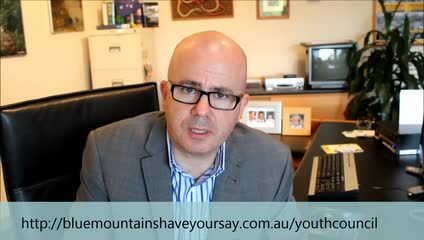 To see videos and photos from the conference and find out more about the Youth Council, follow them on Facebook by searching ‘Blue Mountains Youth Council’ of visit http://bluemountainshaveyoursay.com.au/youthcouncil . Photo: Our young people have a lot to offer. Blue Mountains youth Councillors attended the 2017 NSW Youth Council Conference at Macquarie University to learn and return with new skills focused on the use of technology. Lawson is about to POPP with a new Public Outdoor Ping Pong table in the Lawson Town Centre provided by Blue Mountains City Council, in partnership with the Blue Mountains Youth Council and the Mid Mountains Neighbourhood Centre. An initiative of the Youth Council, the new outdoor weather-proof table tennis table is a first for the Blue Mountains and is on trial for six months. Mayor, Cr Mark Greenhill, said this is a wonderful initiative of the Youth Council. "Outdoor ping pong is fun way to enjoy a shared public space", he said. "It’s free, easy to play and a safe game for people of all ages and abilities to play. I encourage residents and shop owners and staff to make the most of the ping pong table during the six month trial." Ward 2 Councillors, Brent Hoare, Romola Hollywood and Chris Van der Kley enjoyed a game in the sunshine with Youth Councillors Brodie Wylde, Delilah Scott, Caitlin Marlor and Ben McGrory, and agreed that the outdoor ping pong table is a real hit! The Councillors were pleased to see the outdoor ping pong table bring the Lawson Town Centre to life. The idea of the outdoor ping pong table was inspired by feedback from young people that more opportunities were needed for social recreation that is outdoors and free. Almost two months into the trial period, the outdoor ping pong table has been very popular with locals of all ages. The Mid Mountains Neighbourhood Centre act as custodian of the bats and balls, and are helping to raise awareness of the outdoor ping pong table within the Lawson community. By all accounts the equipment is getting returned and people are even buying a bat and ball set to keep in the car so they can play at any time. Council will consider the future of the outdoor ping pong table after the trial period. Photo: Ward 2 Councillors, Brent Hoare (left), Romola Hollywood (striped top) and Chris Van der Kley (right) enjoyed a game of outdoor ping pong in the sunshine with Youth Councillors Brodie Wylde, Delilah Scott, Caitlin Marlor and Ben McGrory, and Mid Mountains Neighbourhood Centre Community Development Worker Danielle Wilding-Forbes (red top). The May meeting of the Blue Mountains City Council had a temporary change to its leadership with the appointment of Youth Councillor Maisy Costa to serve as Assistant Mayor and co-chair of the meeting. Mayor, Cr Mark Greenhill, assisted the 13-year-old Blue Mountains Youth Councillor in her role at the helm of the City for a period of a few hours. Maisy is a new, incoming Youth Councillor. A Hazelbrook resident and student at Springwood High School, Maisy joined the Youth Council to become a voice for younger people in society and help promote safe places for young people to meet in the Blue Mountains. She is an active member of her school’s Student Representative Council, plus participates in sports and her church community. During the Council meeting, Maisy had the chance to address the Councillors on a couple of meeting items expressing a valuable young person’s perspective on local issues. The opportunity to act in the role of Assistant Mayor and co-chair of the meeting is available to Youth Councillors once a year. Maisy was selected for the role by random ballot at the previous Youth Council meeting. Councillors unanimously resolved to endorse the membership of the 2016 Blue Mountains Youth Council thank the outgoing Youth Council members for their contribution to our community and welcome the 10 continuing and 15 new members of the Youth Council. The meeting also heard a report on the activities of Blue Mountains Youth Council presented by returning Youth Councillor Benjamin McGrory. Benjamin thanked the Council for the leadership opportunity and stated his commitment to helping young people with mental health challenges. 2016 Blue Mountains Youth Council membership: Joey Jones-Romeo, Benjamin McGrory, Ruby Moria, Brodie Wylde, Lemuel Appel, Aleksandrs (Sasha) Titovs, Grace Faulder, Kiralee Roscoe-Bynon, Zoe Mikulandra, Paul Mukhin, Eden Conway, Maisy Costa, Andrew Gunn, Meg Hill, Rowan Holdaway, Sophie Jansons, Samara McCabe, Lily Mikulandra, Leah Roscoe-Bynon, Chloe Saunders, Delilah Scott, Jasmine Scott-Smith, Jordan Taylor-Colless, Jasper Tobin and Caspar Zauner. Photo caption: Blue Mountains Mayor, Cr Mark Greenhill, with Blue Mountains Youth Councillor, Maisy Costa, who was Assistant Mayor and co-chair at Council’s May 2016 meeting. Youth Week in NSW is a week-long celebration held in early April each year that is organised by young people, for young people, in communities across the state. It is an opportunity for young people to express their ideas and views, act on issues that affect their lives, and create and enjoy activities and events. Blue Mountains City Council is interested in the needs and aspirations of young people in our community. If you are between 12 and 19 years old, live in the Blue Mountains and want to make a difference, why not join the Blue Mountains Youth Council? The Blue Mountains Youth Council is a committee of 20 local young people, who meet monthly to identify and discuss issues important to young people, plan and run events, and advise the Council. Successful applicants may remain members for two years and then reapply thereafter if they wish. Anyone can apply if they live in the Blue Mountains and are between 12 and 19 years old. The Youth Council has young people from all kinds of backgrounds, nationalities and ages. Applicants don’t need any experience, just an interest in what’s happening around them. Nominations are open now until Friday 3 February 2017. In 2016 the Blue Mountains Youth Council helped to organise an exciting youth congress ‘Project NOW’ that saw amazing youth-driven ideas turn into a reality. Some of the projects include the production of a radio show, a refugee support group, a community garden and an environmental awareness campaign called One Planet Week. Blue Mountains Youth Councillor, Adam Tjoelker said, “Since joining the Blue Mountains Youth Council in early 2016, I have greatly expanded my opportunities to get involved and have a say in a wide range of community activities." To apply or find out more, select the tab to apply on this website, or contact Council’s Youth Services Development Officer, Anita Kazis on akazis@bmcc.nsw.gov.au or 4780 5680. Christmas is fast approaching and most young people are looking forward to the celebrations. However, not everyone is so fortunate. To help improve this situation, the Blue Mountains Youth Council is running the Community Christmas ‘Giving Tree’ again. The Community Christmas ‘Giving Tree’ is located in Springwood Library. Residents, local businesses and organisations are invited to donate a gift by Friday 16 December. Those who donate may also like to add their names to a gift tag, which will be used to decorate the tree. Donations can also be delivered to Council’s headquarters in Katoomba. All donations received will go to the Platform Youth Services organisation, who support young people between the ages of 12-25, and will distribute the gifts to vulnerable young people, in the Blue Mountains, Penrith and Hawkesbury areas. Teenager-friendly Christmas gifts include music items such as iTunes vouchers or headphones; movie ticket vouchers; accessories like hair clips; or clothes such as t-shirts. Photo: Blue Mountains Youth Councillors (L-R) Maisy Costa, Adam Tjoelker, Caspar Zauner, Eden Conway, Meg Hill, Grace Faulder, Sasha Titovs and Paul Mukhin helping to decorate the Youth Council’s ‘Giving Tree’ at Springwood Library. The community is invited to donate gifts for young people in need in the Blue Mountains for Christmas.